A Bride On A Budget was provided these envelopes for review. 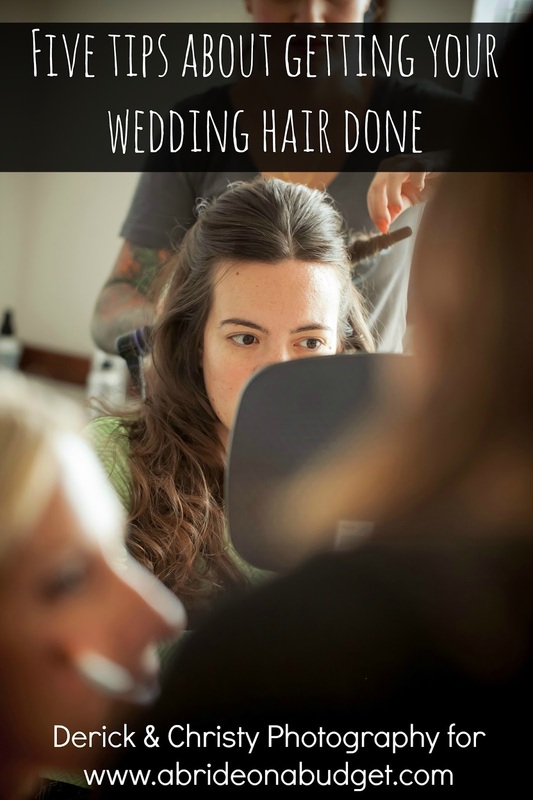 All additional items were purchased by A Bride On A Budget. All thoughts, opinions, and photos belong to ABOAB. If you remember my wedding invitation saga (and rescue) post, I had my invitations designed. I discussed sizing with Nicole from Glossie before she designed them and I checked online to see if they would fit in envelopes. I printed them myself (well, I brought them to OfficeMax, but I mean the designer didn't print for me) so when I picked them up, they were sans envelopes. I did what any normal cost conscious person would do: I went to Walmart for envelopes. The insert cards were 3.5 x 5 and the closest Walmart had was a box of 3.625 x 6.5. It was the closest size, so I brought it home. And then I tried to stuff them. The didn't fit right. There was so much extra room on both sides. I picked the correct size from JamPaper (and was sent the envelopes for this post) and, well, you can see the difference below. White on white is a little hard to see, but the envelopes on the left are 3.625 x 5.125. That's over an inch difference on the width from the Walmart envelopes on the right. And you can just tell. When people send back those RSVP cards, they won't be swimming in the envelope. They'll actually look like they were the right side. And that's part of the difference between making your wedding look professional and look DIY. Sure, you might not really think it matters. So what, you say, the envelope is a little big? But it doesn't take that much effort to find envelopes that fit and it looks like a professional did it. It doesn't look like you just had a spare box of envelopes lying around that you used for your cards. 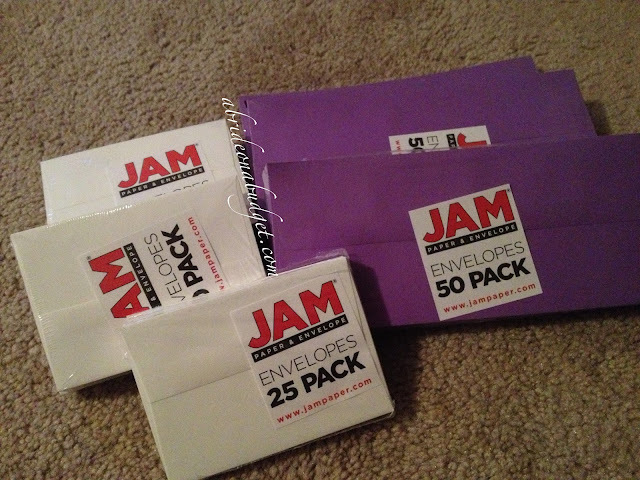 I ordered White A1 Envelopes and Purple #10 Envelopes. I'm super detail oriented, so I made sure to coordinate my envelopes. I made sure that they both had the same backside (you can see they're both the rectangle back, which is called announcement, as opposed to a triangle, which is a baronial). Will my guests notice that? Probably not. But did I notice and did it make me feel better about my invitations? Yes. 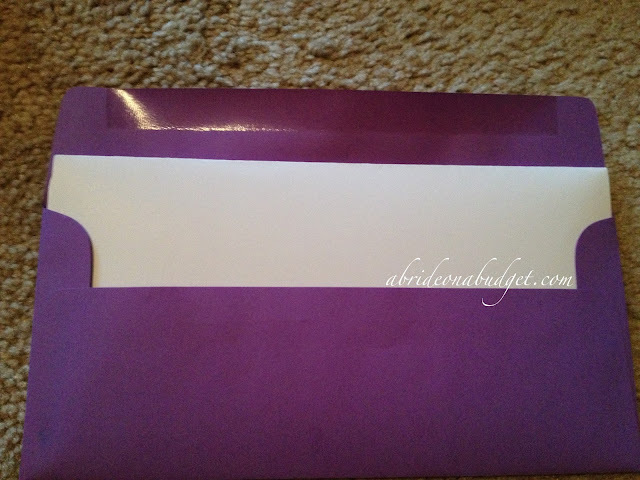 I used the white envelopes for the RSVP cards and the purple for the main invitation. The purple invitation fit my invitation perfectly as well. This wasn't luck. There are actually a ton of different envelope sizes. If you are just using envelopes to mail bills, you don't think about this. You know that there are long envelopes and the short ones, and you leave it at that. But once you need to know, you find out that there's so many more. You can google and find an envelope size/type list (personally, I used this list). You can see the different types of envelopes (with images) plus sizes of envelopes -- and what size paper will fit in those. Once you have your sizes, you can place your order. JamPaper is the same brand of paper we used for our flip flop basket, so I knew that the colors would match. That's something you really want to be concerned with. 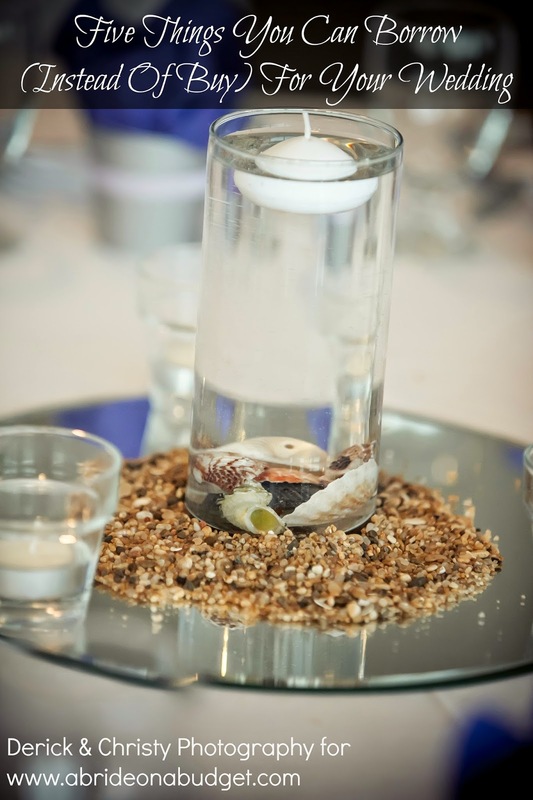 If you are DIY'ing the majority of your wedding, you want that to be something you know and something your guests never find out. You want to give the illusion that you paid top dollar for everything. You can save money, but you don't want to look like you saved money. And part of that illusion is created by really making the details count. Make sure your envelopes fit your cards. Make sure your colors coordinate. Make sure you tie your loose ends. The purple envelopes were such a deep regal purple. 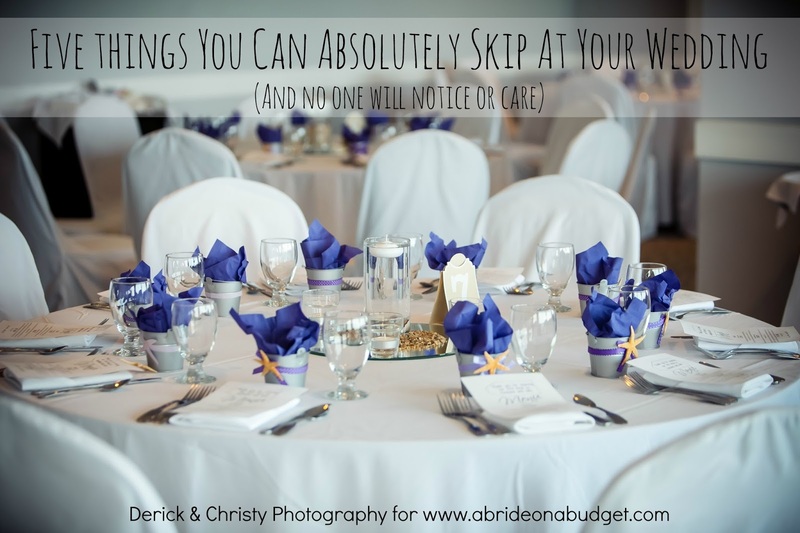 Remember: You're sending a wedding invitation, not a phone bill. You want it to stand out among the rest of the day's mail. This purple was so bold that I know it stood out in the mail. I couldn't be happier with these. And since I took so long to finally send our invitations, I knew everything had to be perfect. These envelopes definitely helped to make that happen. 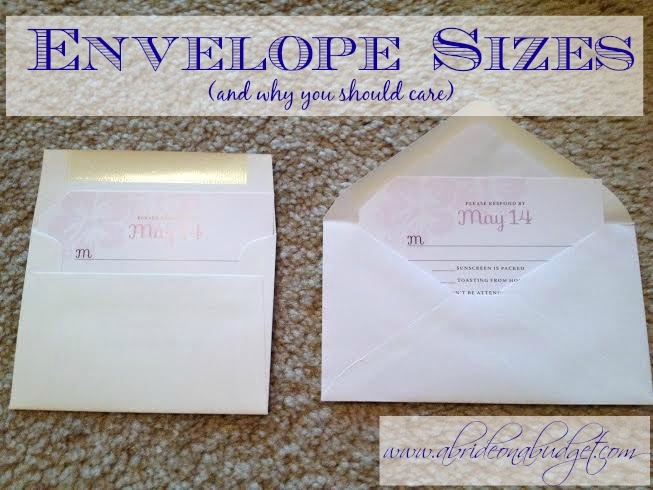 BRIDAL BABBLE: Did you know about multiple envelope sizes and styles?